Dolmen Resort Hotel, Qawra Street, St. Pauls’ Bay, Qarwra SPB 05, Malta. 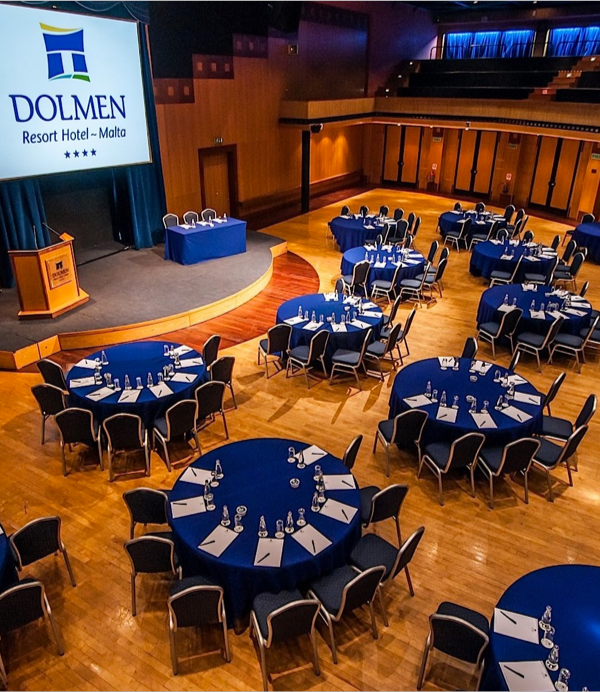 The Dolmen Resort Hotel has for some years been a very popular venue for international and local conferences, seminars and incentive groups. To cater for the growing demand in this sector, the Dolmen Resort Hotel launched the Oracle Conference Centre. This multi-purpose conference centre, one of the largest in the local hotel industry, allows the hotel to accommodate large conferences and seminars. The Conference Centre’s modern design gives full flexibility to organisers. It is complete with state-of-the-art visual facilities to ensure the highest quality in sound and vision reproduction. The main hall of the Oracle Conference Centre provides a large open plan area to ensure the maximum flexibility in utilization and layout. This makes it particularly suitable for activities such as product launches/entertainment. The main hall and syndicate rooms are situated on the first floor with their own entrances and foyer area. The main hall comprises of inner and rear circles together with a gallery. The rear circle can be divided in five syndicate rooms with sliding partitions. The gallery is situated in the main hall overlooking the inner circle and may accommodate guests or delegates in theatre style. The Oracle Conference Centre is fully geared to meet the needs of international conference organisers seeking high caliber and cost effective conference facilities. The syndicates can be used individually or collectively and are ideal for smaller meetings, receptions and exhibition displays.